I have high blood pressure. It is a condition that I have been dealing with for a few years now due to a high stress job, busy life and the fact that my parents are ill and live in a different state. It is hard to receive phone calls about your Mother or Father being sent to the hospital / having surgery / falling and breaking a hip / etc and not being able to be there. I was recently told that my blood pressure was high enough that I could have a stroke. A stroke. At 31? The circumstances were BAD that day (it was the day the hip was broken and I forgot to take my medication), but it still was an eye opener. I realized that I really need to start monitoring my blood pressure. Luckily, I also learned about MeasuPro Blood Pressure Monitors that same day! Uses Measure and Inflate advanced technology to automatically measure blood pressure and pulse rate. Stay informed with accurate readings. Has a Two User mode with easy one-button operation and a large backlit LCD display for increased visibility. Using a BPM has never been easier! Wireless, compact and portable. Transport this lightweight monitor on-the-go and conveniently store this monitor anywhere. Easy and efficient! Averages the three previous measurements and stores up to 120 measurements with 60 records per user. Seamlessly keep track of your pressure. Features a graphical bar display of your blood pressure and heart rate readings. The Built-in Smart IHB indicator alerts of irregular heartbeat. I love that the monitor has a two user mode and records up to 60 measurements per user! This allows my Husband to use it also without interfering with my data. For the record...his blood pressure is great despite the fact that he says I make it high. Haha. The monitor also keeps track of the date and time so that you can easily track your blood pressure at different times of the day, different days of the week, etc. I know mine is much higher on my work days and now I have proof of that. The above picture has one of my better recent measurements. I like how the little bar at the bottom tells me that my blood pressure is "High Normal". My Husband's results always say "Normal". There is also some very helpful information located in the user manual. For instance, according to the American Heart Association a normal Systolic Blood Pressure (the higher number) would be less than 120 and Diastolic BP less than 80. Also, did you know that your blood pressure varies throughout the day? It can be affected by the position you are sitting in when taking your blood pressure, caffeine, the temperature of your environment, smoking, food, taking a bath, talking and moving your fingers, etc. The user guide comes with a lot of great tips to obtain an accurate measurement. 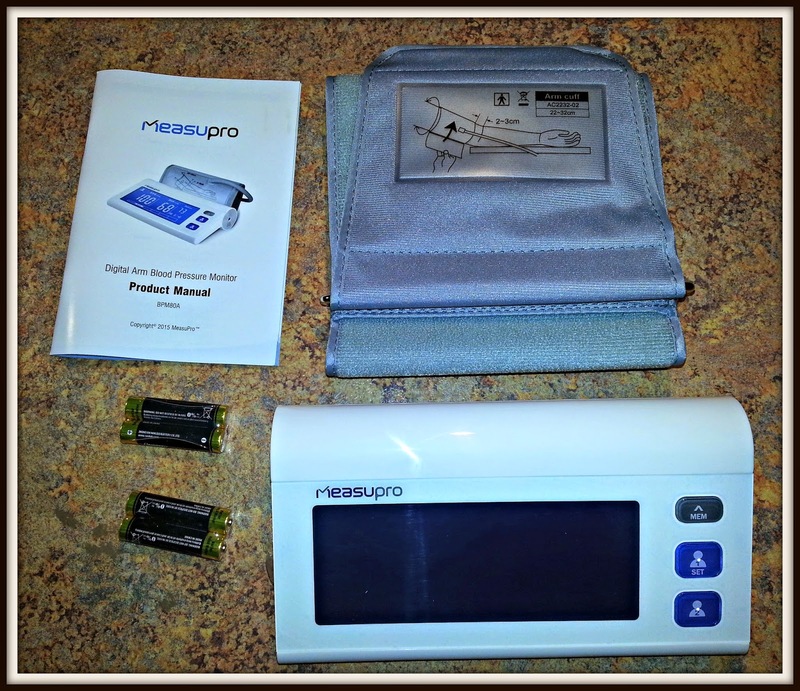 I definitely recommend buying a MeasuPro Blood Pressure Monitor. 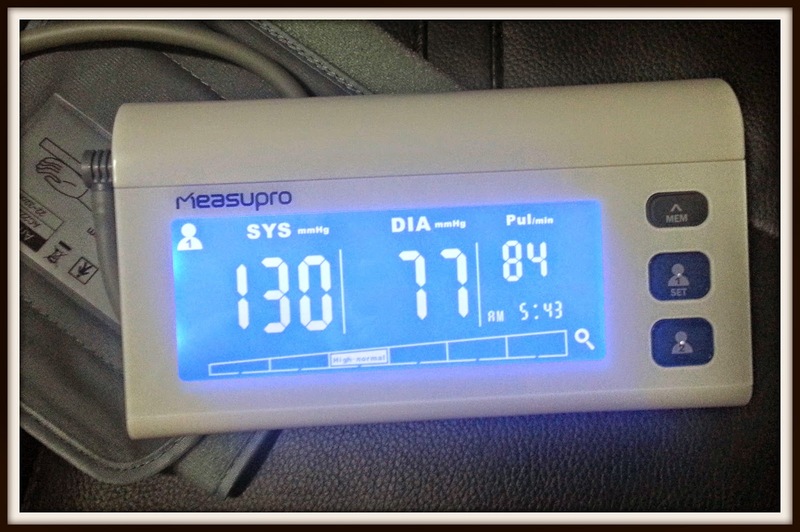 It has helped me to have peace of mind that my blood pressure really isn't as bad as it was on that one day. It is also helping me to ensure that it doesn't get that high again. While you really should see a Doctor to monitor your blood pressure, that is unrealistic for many of us with the current health care situation. 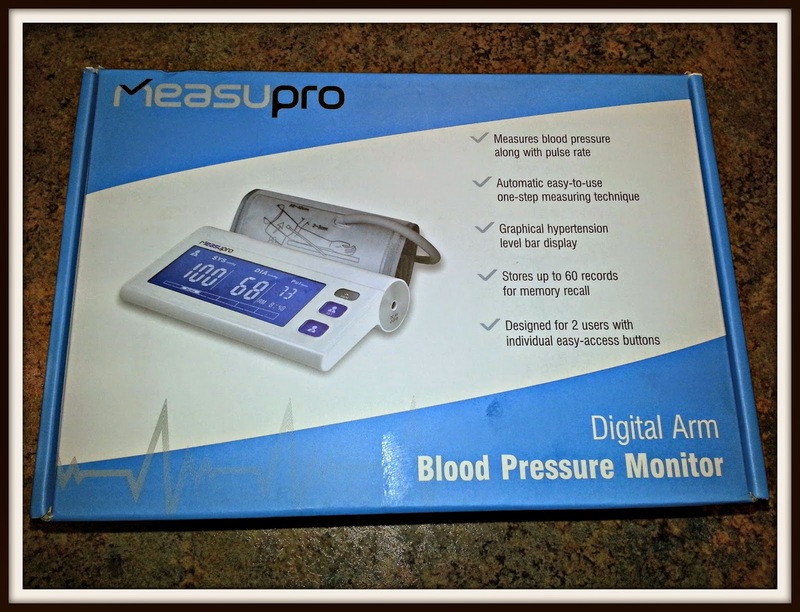 Do you monitor your blood pressure at home? *Disclaimer: I was provided with a free product in exchange for this review. All opinions are my own honest thoughts. I would never recommend a product that I do not support. Glad you're taking care of yourself and monitoring your BP! That can be so scary! We have some crazy genes in our family, as most of us have super LOW BP. Mine usually runs anywhere from 100-110/60-70! My mom's BP ran even lower all throughout her life! I didn't know you had high blood pressure! Yoga will help, we can finally get you into a class! (There's also some poses that AREN'T good for high blood pressure and now we know to modify those!) Good for you for monitoring, that looks pretty cool! I've never checked my BP at home - only at my doctor visits. So glad to hear you have a machine to monitor at home - medical things can be scary! This looks like a great little machine to have and very helpful that your husband's data doesn't interfere with yours!